21 year old Rachel Baiocco (3rd from the left) recently won the Miss Delaware USA title. She stands 1.7m tall and will now undertake the mammoth task of trying to become "the one that breaks the infamous Delaware curse". Her state has never made it to the semi-finals at Miss USA. Could she be first lady from her state to make it?! Delaware has sent some amazing girls these last few year but still the curse stands. I wonder if it will ever be broken. I will keep an eye on this girl. 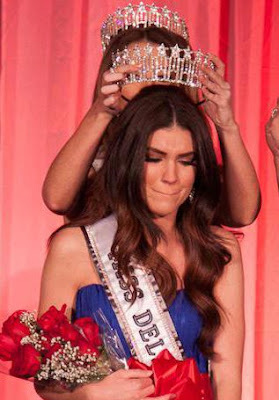 Until this year, Rhode Island had not won either Miss USA or Miss America & that changed, thanks to Olivia Culpo. So Delaware can make the semifinals, it just takes a good contestant who performs well enough for the judges to get it done.